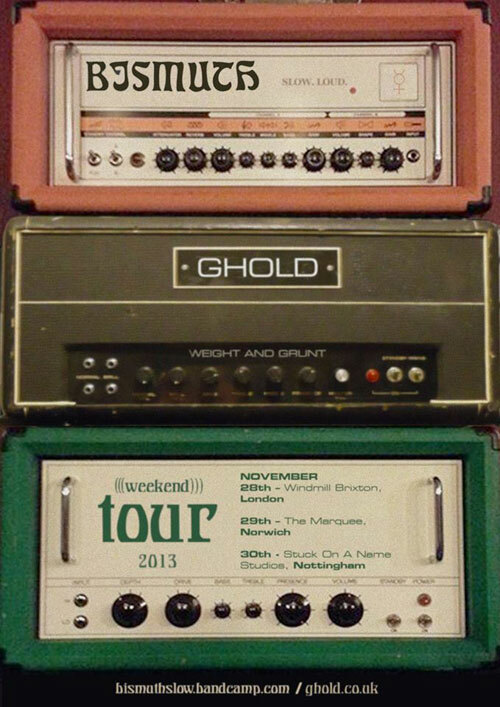 Home » News » BISMUTH & GHOLD UK Tour Kicks Off This Week! Pre-Orders have now started (available HERE) for the BISMUTH split with UNDERSMILE, a co-release between Tartarus Records, Graanrepubliek Records and At War With False Noise, it’ll be available on LP (100 Red & Black / 200 Black), 100 Gold Cassettes with an official street date of January 2014. While GHOLD are currently supporting ‘Galactic Hiss‘ EP which is out now via Baitin’ The Trap Records and is limited to 150 CD’s in a lovely matt finish gate-fold style sleeve. A Smashing little package from a smashing band!